I stumbled onto this recipe here. shredded paper (you can used newspaper–I used paper from our shredder, so it was mostly from bills etc, but not slick paper). 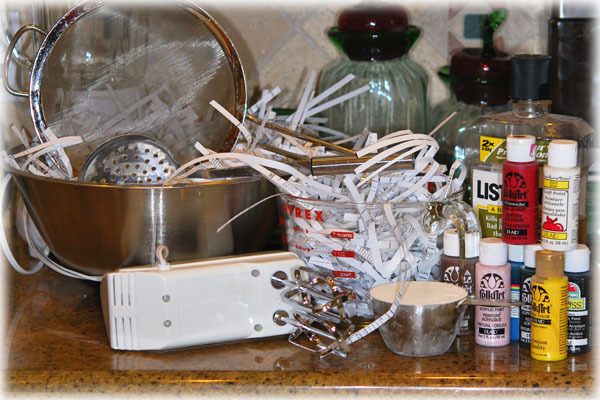 If you use paper that has not been through a shredder, tear it into small pieces, and fill your 2 quart bowl or pan with the pieces. Meanwhile, bring 1/2 gallon of water to a boil. Slowly add the paper, stirring as you add it, so that it does not clump. 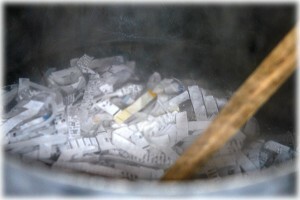 Turn the heat down to medium, and continue to cook it, stirring occasionally, until the paper breaks down. The recipe says about 20 minutes, but I ended up cooking it about 35 minutes until it really seemed to be breaking down. Then turn the heat off and remove from heat. Let the pot cool until you can touch it. I accidentally got involved in something else and forgot about it and it was VERY cool when I remembered it, so it’s apparently not really critical. Beat this mixture until it’s smooth. I thought it had the consistency of oatmeal. It was smooth, but still just slightly lumpy. Maybe you can get it smoother, but I could not get it really smooth with a beater (which is what I take them to mean when they say mixer). However, it was fine. 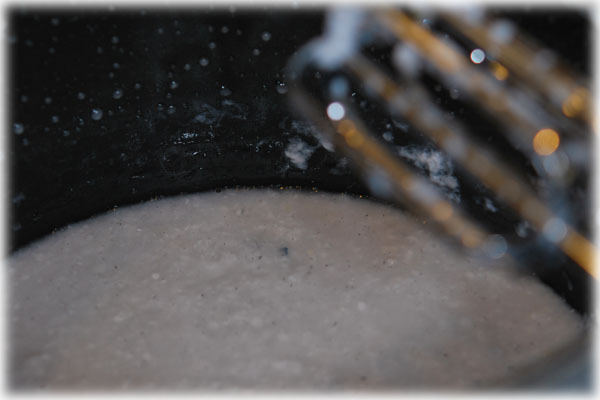 Pour this into the strainer (I used my wire strainer. I think you could use a colander, but you should probably use cheese cloth or fabric in the bottom). Don’t squeeze the moisture out, just let it drain and drip a bit. 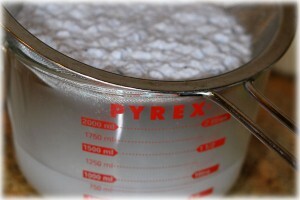 Then put it back into your big pot, add the cup of flour and mix it up. Cook this on low heat until this is “stiff enough to stand in piles.” Hmm…. I don’t know what this really means. Mine didn’t take long, it was already pretty stiff, maybe I let too much water drain out. At any rate, after a very short cooking period, it seemed ready. Remove it from the heat and add the Listerine and mix well. You will have a nice little mass of paper mache you can drop onto some newspaper or paper towels (to absorb excess moisture) while it cools. This stuff works much like clay, altho it’s a bit sticky. My biggest problem was that I didn’t have any idea what I wanted to do with it once I had it! So, I sort of made beads by default. The instructions suggested that you could speed drying by putting your things into a 200 degree (F) oven, and I’m always all about speeding things along. So, I made some little roundish things and used a tooth pick to make holes through them. I also made a few little disks with 4 holes in them (buttons!) and a few other odd shapes, just because. 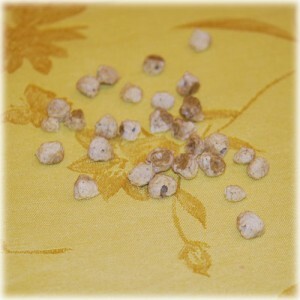 I cooked them, and the “beads” ended up looking like sad little raisins! So… I didn’t take any photos, but I thought, well, I have to do something with them. I still had a lot of paper mache glop, so I put it into a ziplock and into the fridge for later when I thought of something else to do with it, and proceeded to paint my little sad raisins. Ultimately, I ended up with this. OK, not nearly as bad as I thought. 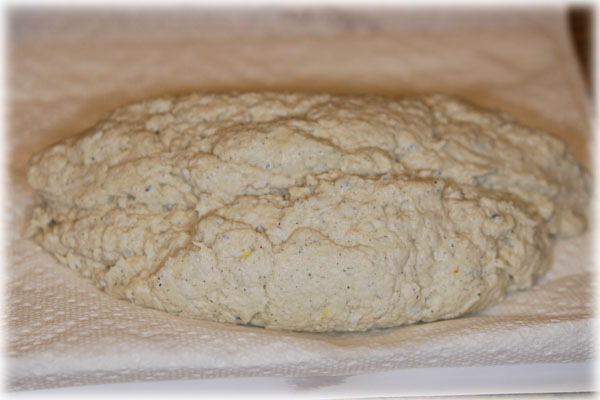 But of course, I couldn’t really blog it, because I didn’t take any pictures past the big blob of glob on the counter. 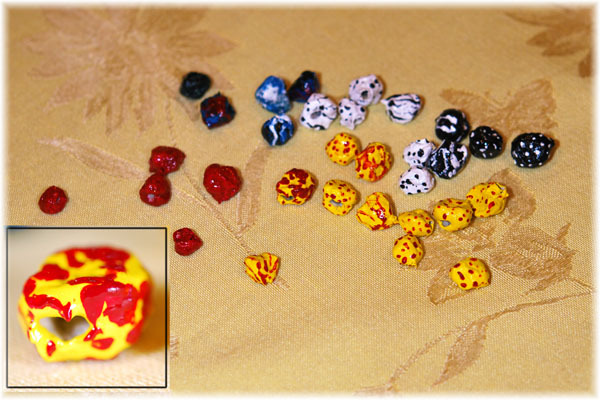 So, I made another batch of beads, and took some photos. My husband says they are “organic” looking. Not everyone’s taste, I’m sure, but I rather like them. 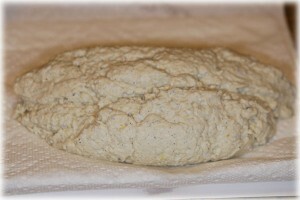 I think, because the paper mache has so much moisture in it, when it dries in the oven, it dries unevenly (like a grape, which does become a raisin!) and so, you get those odd shapes. But, I think it makes them interesting. This little bracelet is going to my Granddaughter. So, I made more beads. This time, I decided it would be smarter to put a piece of wire through them to keep the holes open during the drying process. It worked a little better, this way. 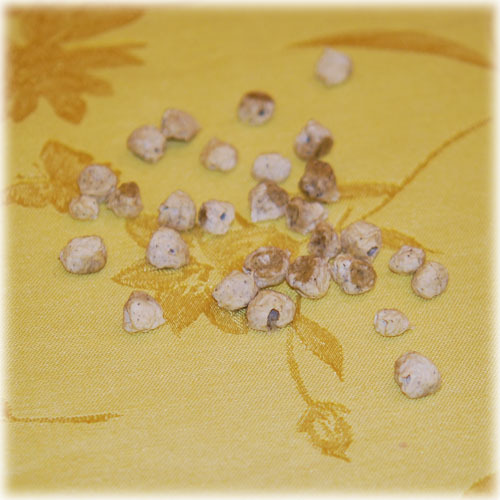 With the first beads, the ones I made with just holes poked via toothpicks, some of the holes collapsed and were hard to “find” after they dried. These were much better. Drying at 200 degrees F took awhile, you just have to keep an eye on them. I didn’t try air drying any of them, but it surely will work if you are patient. They still look like sad little raisins, but at least I knew that a coat of paint would make a big difference. By the way, they smell a little like cooked bread. I don’t recommend eating them anyway. I also think you can probably find a better way to mount them for painting, but I used a potato and toothpicks. Yes, it looked funny but it worked. And it was handy. And when I’m done I can toss that potato in the trash. So, now I had to paint the next batch. I put 2 coats of paint on each one, and most of them I painted some sort of decoration, but just dots of stripes because they were too small to do anything very detailed. I also sprayed a couple of coats of Triple Thick Brilliant Gloss Glaze to make them shiny and protect them. I’m not very artistic anyway. If any of you do something wonderful, I would love to see it. So, there you have it, all of the beads. I made several different palettes, mostly because I got bored. Then I had to think of something to do with them. Other than just a little bead covered potato that is. Jewelry is the obvious answer with beads, but I’m not much of a beader. 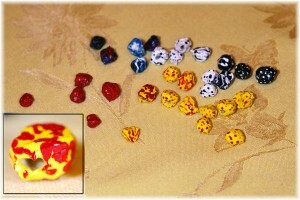 I do have some bead making stuff, mostly for use when I’m in my glass fusing moments. I really wanted to do something with the black and white ones, but I didn’t have anything that went well with them, so I ended up using the red and yellow ones. That’s ok, because those colors are better on me anyway. I rarely make anything for myself, but I ended up making a necklace for me. It’s simple, mainly because my beading skills are so unskillful that I can’t do anything but simple. However, I like it. 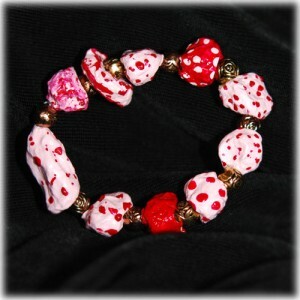 It’s just got a magnetic clasp with red ribbon and small copper spacer beads. But, I like it. And, it was easy. The paper mache is easy to work with, and I have another project already in the works, and a couple of other ideas, so expect to see more of this (and a little better skill level! Hope you enjoyed this, and I hope some of you will try this, it’s a cool thing to do with throw away paper! I think they look wonderful!! What an awesome thing to do with throw away paper. 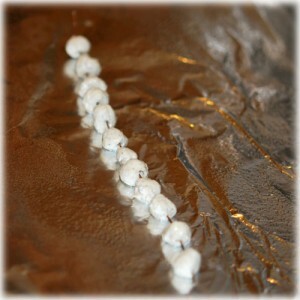 I may just have some fun this summer with Jade, who does like to bead. 🙂 I probably didn’t pay attention but did you use a paint brush to paint the beads? Hey I want a picture of it on you :). I’m sorry, I got tired taking pictures, there were so many steps, and my painting was pretty amateur. I painted the 2 coats with brushes (I have a gazillion brushes, all sorts, none very good, hanging around in my craft drawer from various things, probably all the wrong ones for whatever I’m doing). 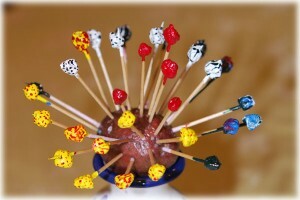 Then I discovered through trial and error that toothpicks were perfect for making dots and lines on little bitty beads. I didn’t have any small little brushes, and one nice thing about toothpicks is that when you make them too goopy and messed up you have no compunction about tossing them in the trash! I would have liked seeing the creation in black and white also, I like what you make, thus I would like to see everything! I hope you understand my english, i used reverso but i think it’s not super ! If I come up with something with the black and white ones, I will probably blog it, I just didn’t come up with a good idea yet! Thank you so much, your nice comments here and on my photos keep me going! You are too funny! And…I have already started another thing. It will be completely different and not jewelry! Can’t wait to see a b&w creation ! 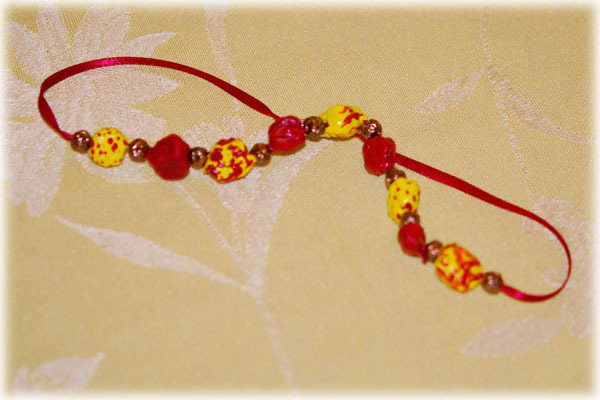 I love the simplicity yet fun, vibrancy of the necklace you made…I would have never guessed it was from old paper!